Evolution and reinvention is a common part of any comics superhero narrative. For characters older than the internet, MTV, and disco music, it's a necessary fact of their fictional lives. Some characters are timeless and don't need to significantly change. That's why Superman is still able to wear red underwear and not seem (too) ridiculous to modern audiences. A character like Carol Danvers, though, needs more shake-ups than most and Margaret Stohl recently gave her the biggest she's had in decades. The Life of Captain Marvel has the plot, upheavals, and shocking revelations to be a major turning point for Carol Danvers. The events of The Life of Captain Marvel #4 significantly alter her circumstances, but not to the point of a full-fledged retcon. Finding out she's half-Kree, and her mother is a Kree warrior, doesn't just change the context of Carol's story. It effectively reshapes her identity. She's no longer some hotshot pilot who gets caught in the crossfire of an exploding alien device. She's someone who is now divided between two worlds, having a human and alien side that constantly pull her in different directions. With the truth of her heritage revealed, The Life of Captain Marvel #5 acts as a culmination of those secrets and their consequences. Stohl puts Carol in a vulnerable position and for someone who can smash asteroids with her firsts, that's saying something. Her past and her mother's secrets are coming back to haunt her in the form of a Kree assassin. She barely has time to process the revelation about her alien heritage. She has to start operating as someone with ties to two worlds, knowing better than most that alien politics is rarely civil in the Marvel universe. While many retcons have a tendency to get convoluted, the stakes for Carol are pretty straightforward. 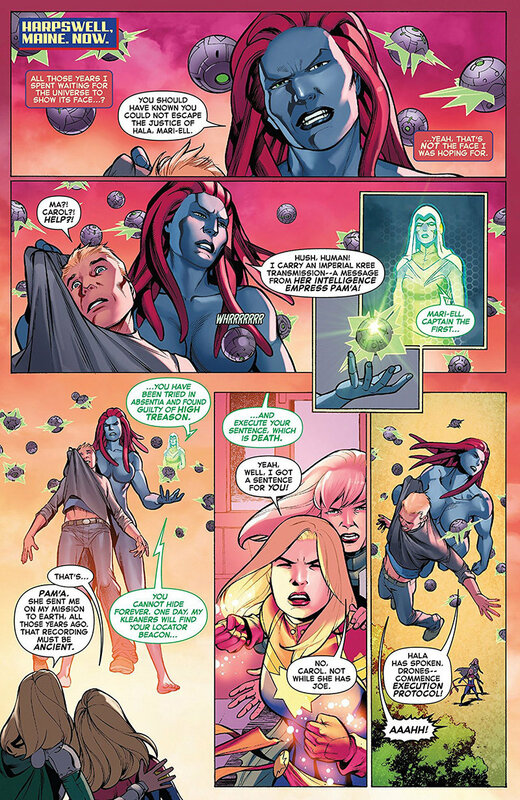 The Kree, in their vastly ruthless wisdom, determine that Carol's mother failed in her mission. For that, she has to die. The Kree don't believe in allowing a margin for error. It means Carol has none, either. She has be both Kree and human to protect her mother. For the first time, she has to embrace every part of who she is and where she came from. It's quite a feat for someone who had been struggling with identity issues before she found out she was half-alien. It also helps set the stage for moments that will likely define this character for years to come. This isn't one of those fights where Carol can just grit her teeth, make a few Star Wars references, and punch her way to victory. It's far more personal, requiring Carol to wear her heart on her sleeve every step of the way. 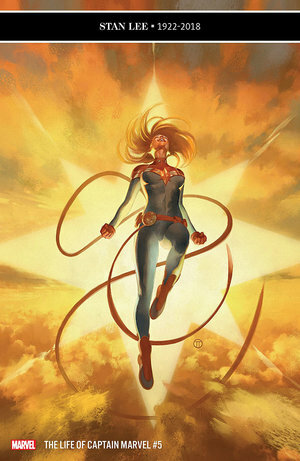 It brings out the best in her as both Captain Marvel and Carol Danvers. Every circumstance and obstacle adds dramatic weight to every action-packed moment. The battle takes place in Harpswell, Maine, a place where Carol has many fond memories as a child. The primary target is her mother. It forces her to do something that Captain Marvel rarely has to do, which is show her vulnerabilities. Stohl brings out the best and worst of Carol's emotions. The narrative she weaves ties defining moments in Carol's past to the unfolding conflict in the present. These flashbacks do more than remind her how far she's come and how high she's flown over the years. It fits the stunning revelations from previous issues into a new context. It doesn't fundamentally change the sequence of events. Carol is still the same hotshot pilot who finds herself at ground zero of an exploding alien device. It just adds new complications to the mix. Carol being half-Kree may not affect how she conducts herself in a fight, but it has an obvious effect on how she sees herself.The Life of Captain Marvel begins with a personal crisis, but learning the truth about herself and having to fight alongside her mother gives her a new perspective. Sthol's use of flashbacks and Carlos Pacheco's colorful artwork help reinforce this every step of the way. Even for Captain Marvel, it's overwhelming. It creates moments where she fully embraces her Kree side, but her humanity never wanes. If anything, it grows stronger. For a while, that strength will be more than sufficient. This is what Carol does, regardless of what the stakes are. She raises the bar, ups her game, and wins the day through unwavering determination and overwhelming power. That is often the standard narrative for Carol, especially since taking the title of Captain Marvel. 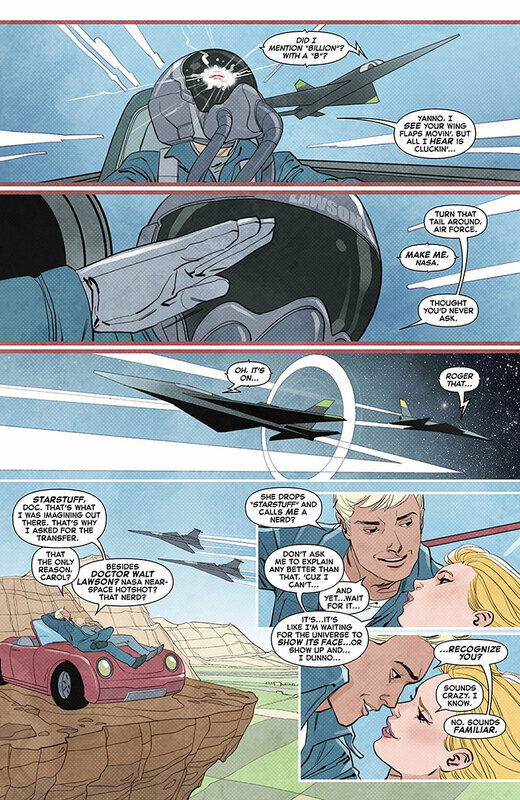 At first, it looks as though The Life of Captain Marvel #5 will remain true to that narrative. That's not how it plays out, though. However, that ends up making the story even more dramatic. Despite all the added motivation Carol has going for her, it still isn't enough. She still saves her home town from destruction, but it comes at a cost. To some extent, it's more of a loss than a triumph. The aftermath hits her harder than any enemy she's ever fought, alien or otherwise. Whereas her Kree side does all the heavy lifting, it's her human side that bears the burden. Just like her Kree side, though, she embraces it. The emotions on display are some of Sthol's finest accomplishments as a writer. Even though the battle doesn't involve invading alien armies or giant space gods, it leaves a mark on Carol that's sure to affect her for years to come. It hits her harder than any renegade Hulk or alien assassin ever could. For once, she has to come back down to Earth and let herself be Carol Danvers, the woman, instead of Captain Marvel, the high-flying Avenger. It's an intensely personal moment that acts as both a beginning and an end to her journey. 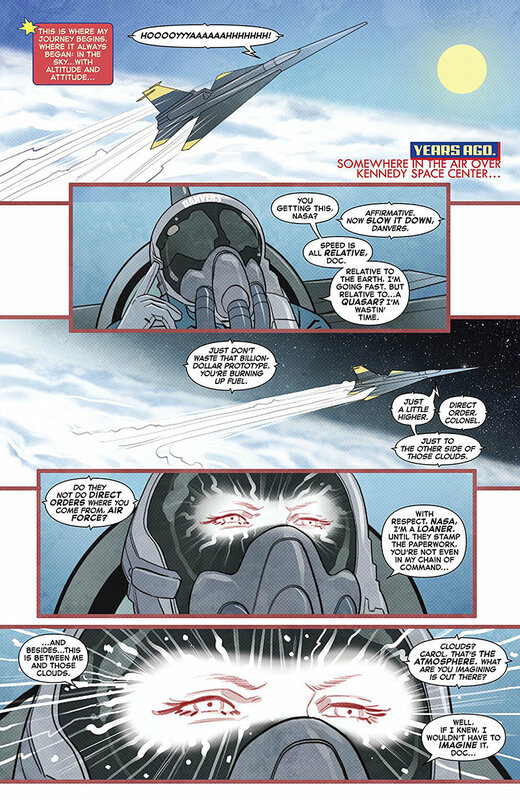 The final resolution of The Life of Captain Marvel #5 sends a clear, but heartfelt message. Carol's life will never be the same. Her past doesn't change, but she sees it differently now. The connections she once avoided now become more meaningful. She sees herself differently than before. She can no longer distance herself from her family, even as a space-faring superhero. She has strong personal ties to both the stars and small towns in Maine on Earth. It's a fitting balance for a character that has undergone so many changes in recent years. With a movie on the horizon and Brie Larson's star power behind her, Carol Danvers' success keeps rising and The Life of Captain Marvel #5 helps raise her story even higher.